Just in time for summer family road trips, two sets of cards aim to keep kids occupied in the back seat: Let's Go! 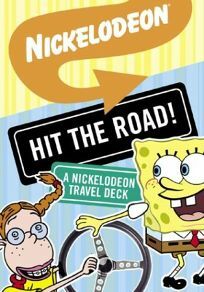 A Nick Jr. Travel Deck and Hit the Road! A Nickelodeon Travel Deck. In the first (aimed at ages 2-6), Nick Jr. characters including Dora, Blue and Little Bill offer up different guessing and I Spy-type games for youngsters. In the second (aimed at kids 7-11), SpongeBob, the Fairly OddParents and others present games like ""That's My Letter!"" in which players race to spell out Nickelodeon character names using letters from passing street signs.